Saturday night may be alright for fighting, but this weekend in Cranbrook it’ll be teddy bear tossing that’s all the rage. The Kootenay Ice are holding their 18th annual A&W Teddy Bear, Toque and Mitten Toss this Saturday when they host the Kelowna Rockets at Western Financial Place. A WHL-wide tradition, fans are encouraged to bring wrapped teddies, toques and mittens to Saturday night’s game and throw them on the ice when Kootenay scores their first goal. The event will benefit the Salvation Army, with the items thrown on the rink donated to those in need this holiday season. This year, the Ice will get a double dose of teddies and toques, as they are the visitors when the Spokane Chiefs hold their event on Friday night, before coming home and doing it again in Cranbrook. 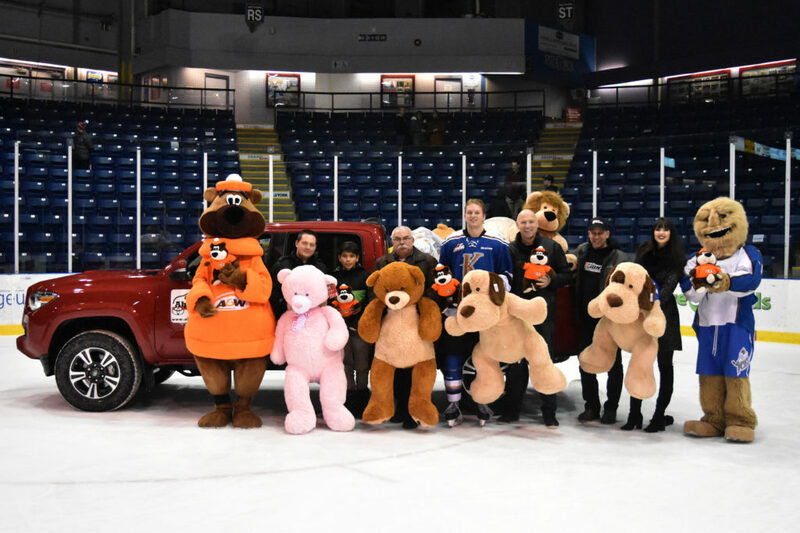 Originated by the Kamloops Blazers during the 1993-94 season, teddy bear tosses have grown into a junior hockey league phenomenon and the Ice joined the party in 1999. Since then, the game has been one that both players and fans look forward to perhaps more than any other game of the season. Over the years, the Toss has had its share of memorable moments and has been highlighted by some unforgettable all-star players. Here are a few Teddy Bear Toss games Ice fans will never forget . . . In just their second season in Cranbrook, the 1999-2000 Kootenay Ice stunned the WHL by winning the league championship. Throughout their entire historic run to the Memorial Cup, defenceman Dion Lassu only scored 5 times, but he was the only player that year to have his tally met with 800 teddy bears. In the Ice’s inaugural Teddy Bear Toss at Memorial Arena, Lassu scored his team’s opening goal in a 4-2 loss to the Red Deer Rebels. It may not have been the most important game the Ice played that year, but it was definitely one of the most fun. Confusion reigned in the second annual Toss, with the stuffed animals flying before any goal had been scored. In the Ice’s 2-1 win over the Rebels, Kootenay fans were a little over-anxious to celebrate and threw their teddy bears in a no-goal situation. With only 24.8 seconds left in the first period, Rebel goalie Michael Garnett had trouble controlling a hard shot, and unbeknownst to him, it was behind him. Bret DeCecco found the puck and put it toward the empty net, but by then referee Glen Agnew had blown the play down because he had lost sight of the puck. DeCecco’s shot didn’t even go across the line. But by then, a couple of bears had fallen onto the ice and then a few more came down. The Ice’s public address announcer Mike Duval said “no bears,” which the audience construed as “throw bears” and thousands starting coming down before they could be stopped. With so little time left in the period, and a long delay set to happen, the teams agreed to go to intermission and played the end of the first just before the beginning of the second. DeCecco eventually did score the actual opening Ice goal in the second period, but only received the handful of remaining bears to mark the occasion. Nigel Dawes scored 159 times for the Ice in his 245 games in the WHL, so it’s no surprise that he was the one who let the teddy bears fly, not just one time, but two-straight years in a row. Although Dawes’ goal in a 5-4 win over the Seattle Thunderbirds in 2002 was a great moment as a then-record 2,289 stuffed toys littered the ice, it was the 2003 game that was his most memorable teddy night. On the night that Jeff Glass added his name to the Ice franchise record book for most shutouts in team history, the Ice kept their fans waiting until overtime to throw their furry friends. In a season where he lit the lamp 47 times in 56 games, it was no surprise that it was Dawes who finally ended the 0-0 stalemate. Beating now-NHL star Devan Dubnyk, Dawes buried a rebound off Josh Morrow’s shot and then basked in a shower of teddy bears in a celebration akin to a playoff series win. While the premise of the teddy bear night usually goes off without a hitch, the pressure of having to score can sometimes be too much for a team to bear. A 1-0 loss to the Swift Current Broncos in 2007 forced the Cranbrook crowd to throw their stuffed toys at the conclusion of the game. Although the night was disappointing for the 2,838 fans carrying more than 2,300 items, without all the pressure of the Teddy Bear Toss, the team was able to make up for it with a 5-2 victory the next night at home against Red Deer. The Ice have only since felt the ‘curse of the teddy bears’ one time, as they lost 4-0 to the Rebels in 2013. A year after getting shutout at the event, Jaedon Descheneau made sure to put a smile on Cranbrook fans’ faces in 2014 and he, in turn, couldn’t help but grin at this own accomplishment. Scoring in just 41 seconds, to set off the fluffy storm, Descheneau became the second player in Ice history to be the teddy bear hero twice. His goal in 2014, a two-on-one with teammate Luke Philp off a neutral zone miscue by the opposition was nearly identical to his 2012 tally, in which Philp fed him on a similar play. “It’s pretty cool [that] it was with the same guy and pretty much the same way we scored,” he told the Townsman after the game. The amazingly fast strike set a record for the crowd’s earliest toss in Cranbrook history, but the mark was amazingly broken the following season by Matt Alfaro who scored just 34 seconds into their match against Swift Current last year. Playing in his final Teddy Bear Toss on Saturday, Alfaro will be looking to match Dawes’ and Descheneau’s two-goal record, and maybe even do it faster this time.